Sgt. 50154 92nd. Field Coy., Royal Engineers. Died Wednesday 13th December. 1916 aged 29. At Rest: Contay British Cemetery, Contay, Somme, France. Grave Ref. : VIII. E. 19. No photo can you help? 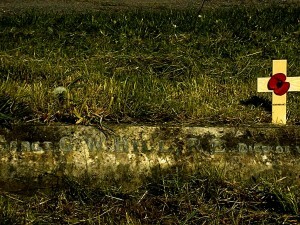 George is mentioned on his parent’s grave in St. Mary’s Churchyard. A resident of Jacksdale, George was born in the neighbouring village of Codnor Park and is also commemorated on the Ironville Memorial. George was the son of the widowed Eliza Hill of ‘Castle View’, Main Road, Jacksdale. (Her husband Philip Aaron Hill having died in September 1915). The 1901 Census records the family as follows – Philip (age 44), Elizabeth (45), Fred (14) born at Codnor Park, George 13 (born at Codnor Park), Rowland (10), Joseph (7) and Phylis (5). George enlisted at Barrow-in-Furness, Lancs. on 9th Sep 1914. He was wounded at the Somme and taken to the 49th Casualty Clearing Station which had been set up in Contay in August 1916. 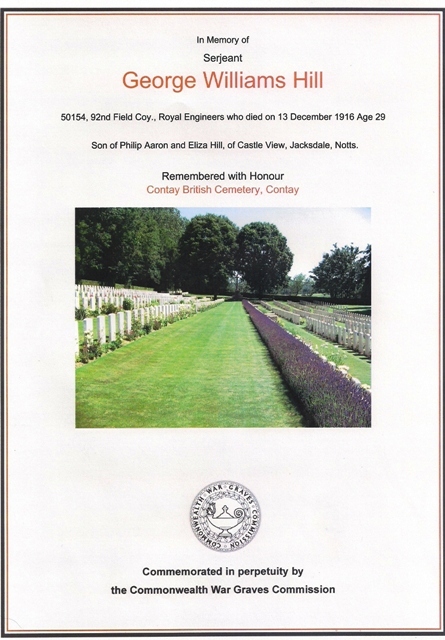 He died of his wounds on Wednesday 13th December, aged 29 years. His father’s obituary in the Ripley & Heanor News in September 1915 stated that Philip Hill left a daughter and four sons, three of whom were serving with the colours. One of which would have been George. However our memorial lists that all of George’s three brothers served, so all four sons ultimately went to war, and fortunately three were to survive. Private Fred Hill regiment unknown. George was awarded the 1914-15 Star, the British War and Victory Medals and is buried at Contay British Cemetery, Somme, France.